If you color squares with n colors at the four sides you get (n^4+n^2+2n)/4 one-sided and (n^4+2n^3+3n^2+2n)/8 two-sided distinct pieces. Only one construction with seven different edges types (406 pieces in a 29x14 rectangle) is shown, other ones can be found at Andrew Clarke's site. For the green marked entries I produced physical pieces and additional constructions are shown. If yellow and green should match, the puzzle is also solvable. In this case it's equivalent to a puzzle with three different edge types (red=straight, green =male, yellow=female). A nice version with three different edge types and 12 addional copies of some pieces giving a 6x6 square is sold by Gamepuzzles. With some patience you can make a 10x7 and a 14x5 rectangle. I have solved both puzzles manually, but it took me a couple of hours. For a computer program it's rather easy. If you don't bother to create the pieces yourself you can get perfect ones with different edge types or different colors from Gamepuzzles. There are 55 edges of same color. Therefore it isn't possible to get all edges matched. If each border of a 5x11 rectangle has a different color, the number of remaining edges of same color is even and a construction can be made. The last part of the construction is at the right border and a lot of pieces with the border color must be saved for the endgame. For one sided pieces this strategy worked, but for the two sided I got some problems. For the two sided pieces the area for the endgame is a square in the right part of the construction not touching the border. 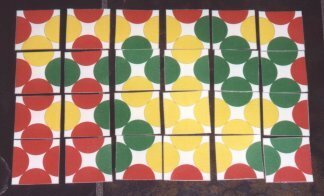 Pieces with two or more red, dark green or yellow edges are used first, then pieces with at least one edge of the mentioned colors are preferred and for the last part of the puzzle only few pieces with these "bad" colors. are left. With different edge types the construction is a bit easier and the endgame can be done at the border. There are 666*4/8=333 edges of same color. Therefore it isn't possible to get all edges matched. 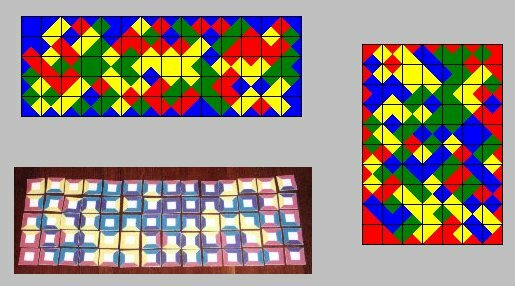 If each border of two 37x9 rectangle has a different color, the number of remaining edges of same color is even and a construction can be made.